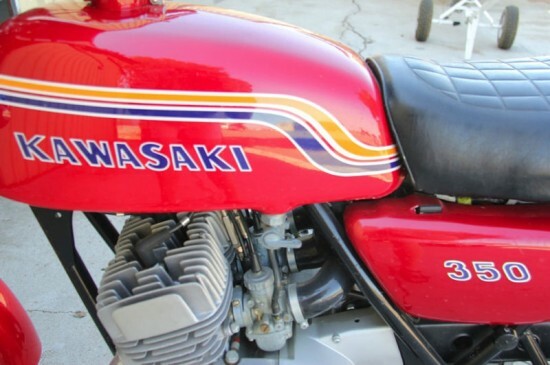 Up for sale for a limited time is this fantastic 1972 Kawasaki S2 – 350. 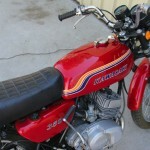 Born from the H1 500cc triple that was launched in 1969, the S2 (also known as the Mach II) was the H1’s smaller brother. Instead of starting small and punching out displacement to a larger size (like Yamaha did with the RD 250-350-400 series), Kawasaki started in the middle and then moved in both directions. The S2 is the kinder and gentler two stroke in the lineup. 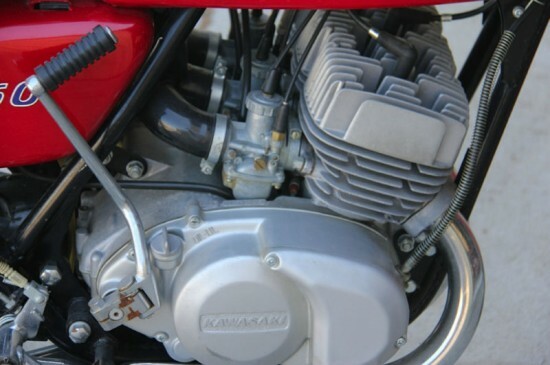 Power from this reed-valve two stroke (replacing the disc-valve engine in the Avenger model) is reported at 45 hp. That is pretty stout for 1972, especially when you consider that the S2 only weighed in at about 350 all rarin’ to go. You can certainly see that this little, unknown bike was really a milestone machine – smaller and lighter became the acceptable order of the day. Of course Kawasaki (and others) would continue to build bigger and bigger, but here we start to see the the middleweight class emerge. 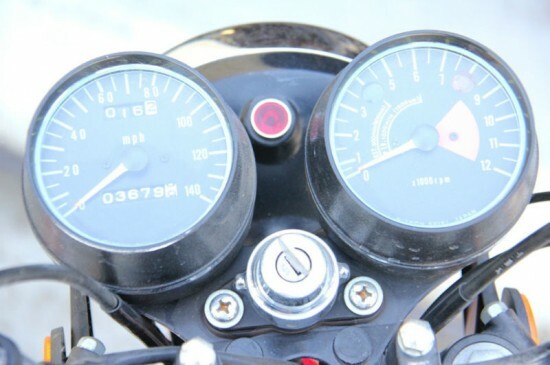 Styling is definitely on the “standard” side, although the use of bodywork behind the seat has been pointed out as the beginning of the sportbike bodywork trend. With the modular taillight treatment Kawasaki could do away with more heavy chrome – and while this seems like a small step between say a CB750 and the fully faired RZ500 a decade and a half later, evolution happens in small steps. YOU WILL NOT FIND A CLEANER ALL ORIGINAL S2-350 UNLESS YOU RAID A MUSEUM! BIKE IS SUPER CLEAN, AND HAS ONLY A FEW MINOR NICKS DUE TO ITS AGE AND TOTAL ORIGINALITY. I HAVE MANY NEW (NOS) PARTS IN BOXES, I WILL BE SELLING THAT COULD BRING THIS BIKE TO VIRGIN APPEARANCE IF THIS IS WHAT YOU SEEK. IT IS SO RARE TO FIND ONE OF THESE IN ANYTHING NEAR CLEAN CONDITION, AND THIS ONE IS NEARLY MINT. ONLY 3679 ORIGINAL MILES, WHICH IS NOTHING, HARDLY BROKEN IN! 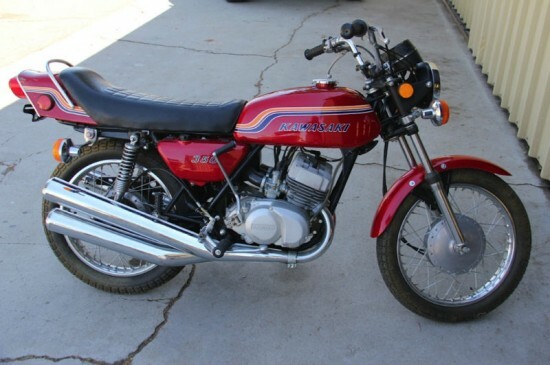 This is a very EARLY S2 350, it even has the one piece left engine cover, VERY rare…..!! 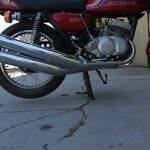 This bike is in incredible condition for its age – from the pictures it is hard to believe that it is nearly 40 years old! As far as collectability goes, the S2 is under appreciated in many circles – if it is known at all. That bodes well for its ultimate value, as the rare and unique will always have an edge in the price inflation game. As it stands, however, collectable Japanese hardware is still not a mainstream hobby; that makes prices more reasonable for the average person. This auction is on right now with the current bid at only $3,550. There does not appear to be a reserve, which means that this museum-quality bike is going to a lucky new owner very soon. 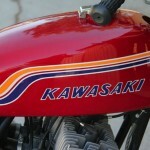 For more details on the bike and to see the rest of the pictures, click on the link and jump over to the auction. Good luck to you!